Tennocon 2018 had a number of surprises for fans of the space ninja MMO, one of which is the new Fortuna open-world Venus update. Developing on many of the features established by last year’s Plains of Eidolon expansion, Fortuna opens up a massive new area for players to explore on the surface of Venus, which promises to create new avenues for every type of player from loreseekers to Fashion Framers. Fortuna adds animal hunting, hoverboarding, gigantic spider boss battles, and a number of new vendors to Warframe. You will also be able to learn about a new Warframe culture, a body-augmented society of slaves called the Solaris. 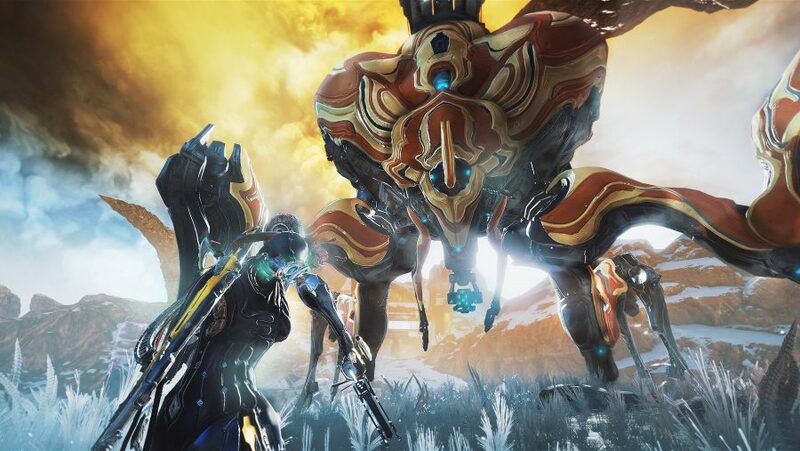 As Fortuna is the second open-world area Digital Extremes is adding to Warframe, it also boasts a number of improvements on the Plains of Eidolon update. From the grand reveal at Tennocon 2018, where we got to see Warframe Fortuna in action and speak to members of the development team, to multiple developer streams – here are all the latest details about the upcoming Venus open-world expansion. Warframe Fortuna is set to launch later today, according to a tweet from the director and a message posted to the Solaris United Discord. Earlier, a stream with Digital Extremes revealed that the Warframe Fortuna release date is set for the first week of November, with the Switch version of Warframe set to drop later in the month on November 20, 2018. This is a little bit later than the autumn 2018 launch date originally provided by creative director Steve Sinclair at Tennocon 2018. Above you can see the full world map for the Orb Vallis, which is the name of the Fortuna open world. If you look for the patches of green you can spot over ten large-scale building complexes, so expect a good mix of outdoor exploration and close-quarters fighting. There will also be a cave system in the Orb Vallis for players to explore on their K-Drive. Like in the Plains of Eidolon update, the open-world area of Venus will feature a main trading and social hub. This market area is heavily inspired by Blade Runner with its monolithic elevator and buildings, not to mention plenty of neon lighting. There are canals of liquid coolant running across the settlement, which are being cleaned and refined by the inhabitants. 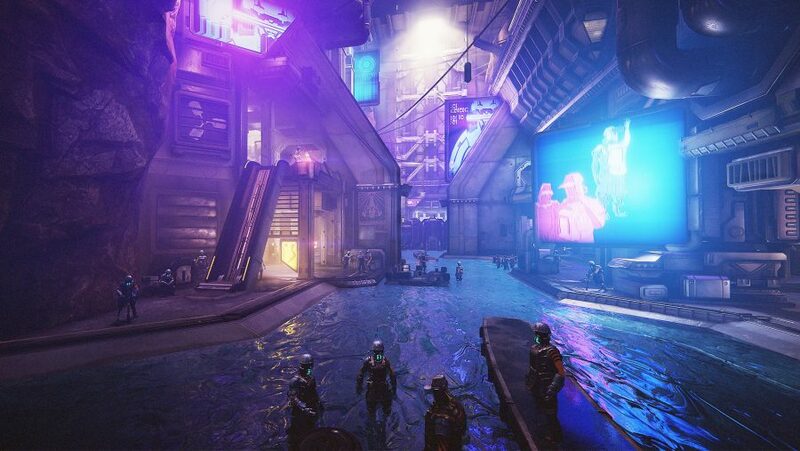 Dotted around the central canal you will find a number of key merchants and NPCs, selling everything from make-your-own Moa pets and kitguns, to fishing supplies and tranq rifles. Spend some time around the hub and you’ll also learn plenty about the culture of augmented people who toil away in service of the Corpus. Out in the snowy tundra that is open-world Venus, you’ll be able to use a new vehicle, the Bondi K-Drive hoverboard. This vehicle was added in response to community feedback about Archwings in the Plains of Eidolon: they let you get about quickly, but as they’re grounded you’ll still get a proper sense of scope and scale when exploring. This being Warframe, you will be able to customise your K-Drive with different skins and possibly even models. You will be able to customise your K-Drive with new decks, which you can unlock by earning standing with a new Warframe faction, the Vent Kids. In addition to visual tweaks, there will also be K-Drive mods that alter the vehicle’s stats. You can even perform tricks on the K-Drive, launching yourself off the terrain to gain a height or speed advantage. K-Drive races have also been confirmed, and will task players with piloting their hoverboard through a series of gates with a limited amount of time, using tricks, boosts, and grinds to reach some deviously placed gates. There will be 20 races at launch and they will be among the daily missions players can complete in Fortuna. Unfortunately, you will not be able to fire your weapons from the hoverboard, although, it’s being considered. However, there will be some melee attacks that incorporate the new Warframe vehicle. 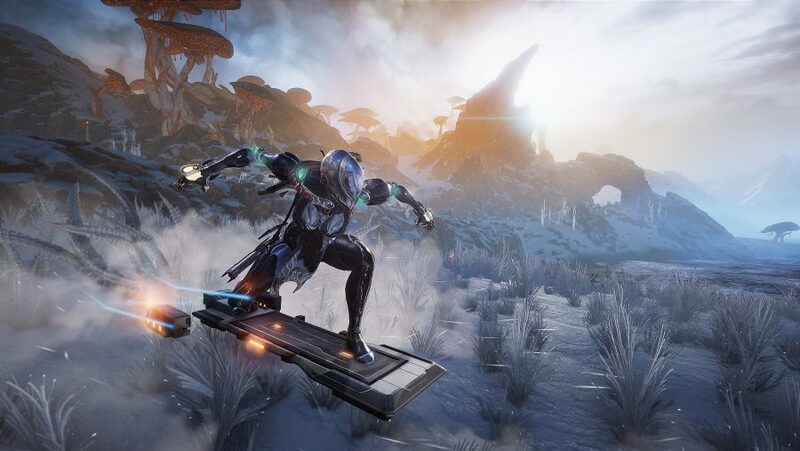 In addition to the K-Drive, you will also be able to use your Archwing to travel around the Fortuna open-world. You will be able to summon the Archwing instantly, making it easier to summon and use than in Plains of Eidolon. The Tennocon reveal for Warframe Fortuna gave us an early look at some of the characters and conflicts going on in this new Warframe open world. 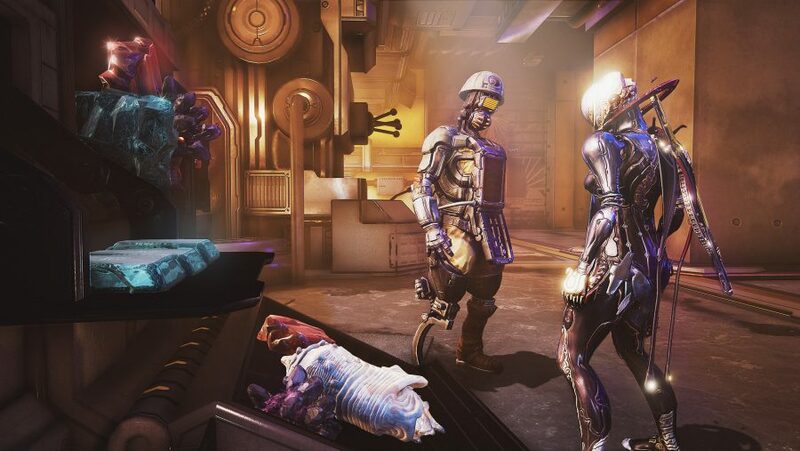 For starters, there are two factions in Fortuna: the Corpus, who are the big bad meanies running things, and Solaris United, a rebel faction working to liberate the people of Fortuna from Corpus debt-slavery. The leader of the Corpus colony is Nef Anyo, who you may remember from previous quests, while Eudico heads up the Solaris United. So, why are the two groups at odds? The people of Fortuna, the Solaris, are labourers who have been enslaved by the Corpus through mounting debts. They work tirelessly to keep refine and purify the coolant that keeps Venus habitable, while the Corpus profit from their labour. The Solaris United want to take back the planet and ensure nobody else succumbs to debt-slavery. Your role in all of this, naturally, is to use the power of the Tenno to aid the Solaris people. One of the key new features in Fortuna is animal hunting, or conservation rather, as you’ll only be tranquillising animals in order to save them from the Corpus and save the species. To save each species you’ll need a specific lure and a tranq rifle, both of which you can buy from The Business in Fortuna’s hub area. When it comes to hunting in Warframe Fortuna, you’ll first have to find some droppings, which you will be able to analyse for clues that you can use to track the animal further. Next up, you’ll need to find some footprints and follow them, while clues like flattened or chewed plants will tip you off further. When you start to get very close you will hear a mating call that is unique to each species. This is where you use your lure to mimic the call of the animal you’re hunting – this takes the form of a minigame in which you use your mouse to copy the pitch of the mating call. Do that successfully and all that’s left to do is hide, shoot the endangered animal with a tranquilliser dart, tag it, and wait for a drone to come and whisk the little cutie away to safety. Plains of Eidolon introduced behemoth creatures for you to tackle as endgame bosses, so it’s only fitting that Fortuna takes things up a level with gigantic mecha spiders that you can see creeping across the horizon at any point. These bosses are summoned when you kill too many of their babies. Another new feature debuting in Warframe Fortuna is strongholds. These are Corpus bases dotted around the Orb Vallis – the surface area of the open-world Venus update – which you can liberate. All you have to do is kill any Corpus in the area and the stronghold is yours, but rather than having to return to the market area to turn in the quest a Solaris United agent will appear at the stronghold to grant you your reward and offer a new quest – no more backtracking. Strongholds will reset between sessions, but they don’t take much effort to capture, so that shouldn’t be an issue. In addition to these strongholds, Warframe Fortuna will also have massive bases that you can seamlessly enter to complete missions. You can also expect to come across plenty of environmental storytelling in these sprawling buildings. These bases are gorgeous and offer a glimpse at the visual revamp Digital Extremes plans on rolling out to all Corpus in the game.